Foundation programme gives us the opportunity to take our understand and spiritual practise to a deeper level - helping us to integrate it naturally into our daily life. Sunday FP offers a special opportunity to join the community for a day, enjoying the company of spiritual friends, teachings, lunch and puja together in this blessed environment. Studying this chapter helps us to gain a personal experience of this truth so we really do appreciate our present opportunities - a meditation guaranteed to dispel depression and discouragement! Through understanding this ourself we can then help others also to have meaningful and joyful lives. This class is taught by Gen Kelsang Losel. 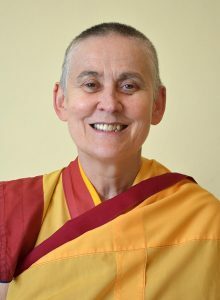 Gen Losel is a senior Kadampa Buddhist Teacher who has been a disciple of Venerable Geshe-la for many years and has taught in the United States as well as in England at Kadampa centres. Having taught abroad for many years, Gen Losel brings a wealth of practical and meditative experience to her teachings. She is known for her ability to present the teachings of Venerable Geshe-la in a practical and clear way and shows how to integrate the meaning of these teachings into daily life. Subscribe to the newsletter and follow on social media. Manjushri KMC is an internationally renowned centre for meditation, where everyone is welcome to enjoy a peaceful environment or join in the many programmes offered throughout the year.